During Nurse Maegan’s shift in a hospital hypertension clinic, a patient came in with her daughter. The 85-year-old patient had her blood pressure taken, and Nurse Maegan noted that it is 210/158 mmHg. The patient attributes the increase of her blood pressure to her age. Hypertension is one of the most common lifestyle diseases to date. It affects people from all walks of life. 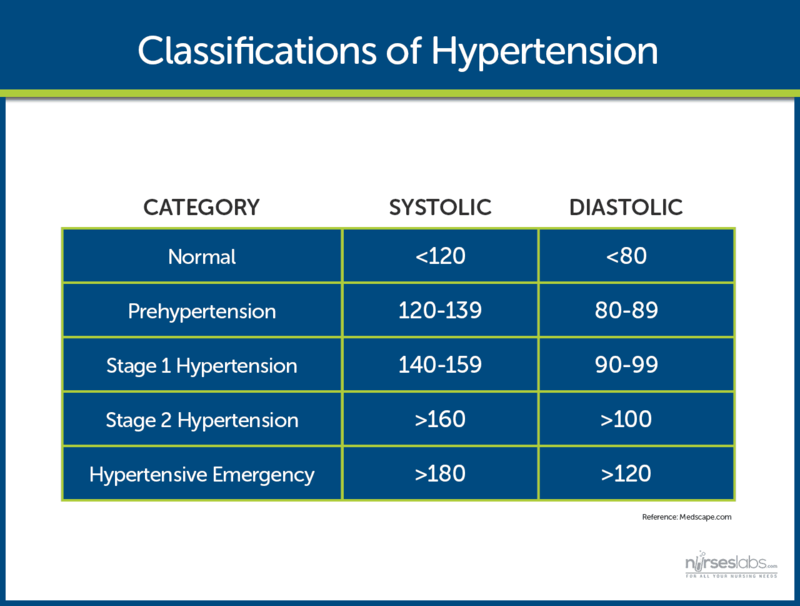 Let us get to know hypertension more by its definitions. Hypertension is defined as a systolic blood pressure greater than 140 mmHg and a diastolic pressure of more than 90 mmHg. This is based on the average of two or more accurate blood pressure measurements during two or more consultations with the healthcare provider. The definition is taken from the Seventh Report of the Joint National Committee on Prevention, Detection, Evaluation, and Treatment of High Blood Pressure. Hypertension has four categories that have no compelling indications. These four categories rely on the blood pressure measurements of the patient so these must be taken accurately. Normal. The normal range for blood pressure is between, less than 120 mmHg and less than 80 mmHg. Elevated. Elevated stage starts from 120 mmHg to 129 mmHg for systolic blood pressure and less than 80 mmHg for diastolic pressure. Stage 1 hypertension. Stage 1 starts when the patient has a systolic pressure of 130 to 139 mmHg and a diastolic pressure of 80 to 89 mmHg. Stage 2 hypertension. Stage 2 starts when the systolic pressure is already more than or equal than 140 mmHg and the diastolic is more than or equal than 90 mmHg. In a normal circulation, pressure is transferred from the heart muscle to the blood each time the heart contracts and then pressure is exerted by the blood as it flows through the blood vessels. The pathophysiology of hypertension follows. Obesity is also a factor in hypertension because hyperinsulinemia develops and structural hypertrophy results leading to increased peripheral vascular resistance. Genetic alteration also plays a role in the development of hypertension because when there is cell membrane alteration, functional constriction may follow and also results in increased peripheral vascular resistance. Hypertension is slowly rising to the top as one of the primary causes of morbidity in the world. Here are the current statistics of the status of hypertension in some of the leading countries. About 31% of the adults in the United States have hypertension. African-Americans have the highest prevalence rate of 37%. In the total US population of persons with hypertension, 90% to 95% have primary hypertension or high blood pressure from an unidentified cause. The remaining 5% to 10% of this group have secondary hypertension or high blood pressure related to identified causes. Hypertension is also termed as the “silent killer” because 24% of people who had pressures exceeding 140/90 mmHg were unaware that their blood pressures were elevated. Increased sympathetic nervous system activity. Sympathetic nervous system activity increases because there is dysfunction in the autonomic nervous system. Increase renal reabsorption. There is an increase reabsorption of sodium, chloride, and water which is related to a genetic variation in the pathways by which the kidneys handle sodium. Increased RAAS activity. The renin-angiotensin-aldosterone system increases its activity leading to the expansion of extracellular fluid volume and increased systemic vascular resistance. Decreased vasodilation of the arterioles. The vascular endothelium is damaged because of the decrease in the vasodilation of the arterioles. Many people who have hypertension are asymptomatic at first. Physical examination may reveal no abnormalities except for an elevated blood pressure, so one must be prepared to recognize hypertension at its earliest. Headache. The red blood cells carrying oxygen is having a hard time reaching the brain because of constricted vessels, causing headache. Dizziness occurs due to the low concentration of oxygen that reaches the brain. Chest pain. Chest pain occurs also due to decreased oxygen levels. Blurred vision. Blurred vision may occur later on because of too much constriction in the blood vessels of the eye that red blood cells carrying oxygen cannot pass through. Prevention of hypertension mainly relies on a healthy lifestyle and self-discipline. Weight reduction. Maintenance of normal body weight can help prevent hypertension. Adopt DASH. DASH or the Dietary Approaches to Stop Hypertension includes consummation of a diet rich in fruits, vegetable, and low-fat dairy. Dietary sodium retention. Sodium contributes to an elevated blood pressure, so reducing the dietary intake to no more than 2.4 g sodium per day can be really helpful. Physical activity. Engage in regular aerobic physical activity for 30 minutes thrice every week. Moderation of alcohol consumption. Limit alcohol consumption to no more than 2 drinks per day in men and one drink for women and people who are lighter in weight. If hypertension is left untreated, it could progress to complications of the different body organs. Heart failure. With increased blood pressure, the heart pumps blood faster than normal until the heart muscle goes weak from too much exertion. Myocardial infarction. Decreased oxygen due to constriction of blood vessels may lead to MI. Impaired vision. Ineffective peripheral perfusion affects the eye, causing problems in vision because of decreased oxygen. Renal failure. Blood carrying oxygen and nutrients could not reach the renal system because of the constricted blood vessels. Assessment of the patient with hypertension must be detailed and thorough. There are also diagnostic tests that can be performed to establish the diagnosis of hypertension. Blood chemistry (e.g. analysis of sodium, potassium, creatinine, fasting glucose, and total and high density lipoprotein cholesterol levels). These tests are done to determine the level of sodium and fat in the body. 12-lead ECG. ECG needs to be performed to rule presence of cardiovascular damage. Echocardiography. Echocardiography assesses the presence of left ventricular hypertrophy. Creatinine clearance. Creatinine clearance is performed to check for the level of BUN and creatinine that can determine if there is renal damage or not. Lipid panel (total lipids, high-density lipoprotein [HDL], low-density lipoprotein [LDL], cholesterol, triglycerides, phospholipids): Elevated level may indicate predisposition for/presence of atheromatous plaques. The goal of hypertensive treatment I to prevent complications and death by achieving and maintaining the arterial blood pressure at 40/90 mmHg or lower. ARBs are competitive inhibitors of aldosterone binding. Beta blockers block the sympathetic nervous system to produce a slower heart rate and a lower blood pressure. ACE inhibitors inhibit the conversion of angiotensin I to angiotensin II and lowers peripheral resistance. Thiazide diuretic is recommended for most and angiotensin-converting enzyme-1, aldosterone receptor blocker, beta blocker, or calcium channel blocker is considered. Two-drug combination is followed, usually including thiazide diuretic and angiotensin-converting enzyme-1, or beta-blocker, or calcium channel blocker. 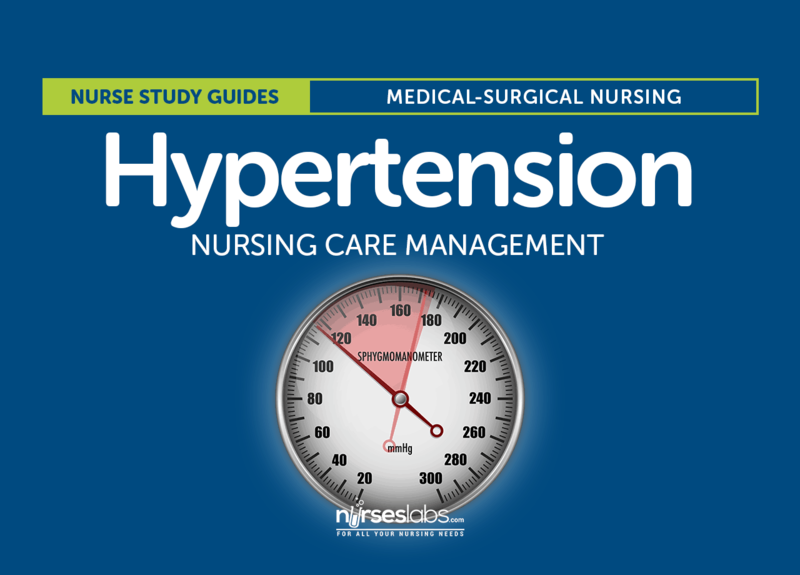 The goal of nursing management is to help achieve a normal blood pressure through independent and dependent interventions. Nursing assessment must involve careful monitoring of the blood pressure at frequent and routinely scheduled intervals. If patient is on antihypertensive medications, blood pressure is assessed to determine the effectiveness and detect changes in the blood pressure. Complete history should be obtained to assess for signs and symptoms that indicate target organ damage. Pay attention to the rate, rhythm, and character of the apical and peripheral pulses. Deficient knowledge regarding the relation between the treatment regimen and control of the disease process. Noncompliance with the therapeutic regimen related to side effects of the prescribed therapy. Risk for activity intolerance related to imbalance between oxygen supply and demand. Risk-prone health behavior related to condition requiring change in lifestyle. Understanding of the disease process and its treatment. Participation in a self-care program. BP within acceptable limits for individual. Cardiovascular and systemic complications prevented/minimized. Support active patient control of condition. The objective of nursing care focuses on lowering and controlling the blood pressure without adverse effects and without undue cost. Maintain blood pressure at less than 140/90 mmHg with lifestyle modifications, medications, or both. Demonstrate no symptoms of angina, palpitations, or visual changes. Has stable BUN and serum creatinine levels. Adheres to the dietary regimen as prescribed. Takes medications as prescribed and reports side effects. Abstains from tobacco and alcohol intake. Following discharge, the nurse should promote self-care and independence of the patient. The nurse can help the patient achieve blood pressure control through education about managing blood pressure. Effects of behavior on health status/condition. Plan for adjustments and interventions for achieving the plan and the people involved. Client responses to the interventions, teaching, and action plan performed. Attainment or progress towards desired outcome. Individual findings including deviation from prescribed treatment plan. Consequences of actions to date. Let’s test what you’ve learned with this 5-item quiz! Stage 1 hypertension is defined as persistent blood pressure levels in which the systolic pressure is ____ and the diastolic is ____. Stage 1 hypertension starts when the patient has a systolic blood pressure of 130 to 139 mm Hg and a diastolic pressure of 80 to 89 mm Hg. Which among the thiazide or thiazide-like diuretics is the most preferred oral antihypertensive drug due to its prolonged half-life and proven trial reduction of Cardiovascular disease (CVD)? Chlorthalidone is the most potent thiazide-type diuretic. Studies show that it provides greater blood pressure lowering effects over a 24-hour period than Hydrochlorothiazide. Prolonged lack of oxygen caused by hypertension results in angina or chest pain.Options A: Dyspnea is not a complication of hypertension. Option C: Epistaxis is not a complication of hypertension. The initial medications recommended for uncomplicated hypertension is beta blockers.Option A: Angiotensin-converting enzyme inhibitor can be used for stage 2 hypertension. Option B: Alpha blockers are not used as a treatment for hypertension. Option D: Calcium channel blockers are used for hypertension instead of calcium antagonists. Patients are sometimes misinformed about hypertension and end up getting confused or misunderstanding the condition.Option A: Heart failure is a complication of hypertension. Option C: Myocardial infarction is a complication of hypertension. Option D: Renal insufficiency is not a nursing diagnosis. 1. Stage 1 hypertension is defined as persistent blood pressure levels in which the systolic pressure is ____ and the diastolic is ____. 2. Which among the thiazide or thiazide-like diuretics is the most preferred oral antihypertensive drug due to its prolonged half-life and proven trial reduction of Cardiovascular disease (CVD)? Prolonged lack of oxygen caused by hypertension results in angina or chest pain. Options A: Dyspnea is not a complication of hypertension. Option C: Epistaxis is not a complication of hypertension. The initial medications recommended for uncomplicated hypertension is beta blockers. Option A: Angiotensin-converting enzyme inhibitor can be used for stage 2 hypertension. Option B: Alpha blockers are not used as a treatment for hypertension. Option D: Calcium channel blockers are used for hypertension instead of calcium antagonists. Patients are sometimes misinformed about hypertension and end up getting confused or misunderstanding the condition. Option A: Heart failure is a complication of hypertension. Option C: Myocardial infarction is a complication of hypertension. Option D: Renal insufficiency is not a nursing diagnosis.